Annatto is a coloring and flavoring agent derived from the seed of the achiote tree. Annatto is a coloring and flavoring agent derived from the reddish pericap encasing the seed of the achiote tree. It’s used to produce a yellow to orange food coloring. The seed is available whole or ground, appearing very deep red, with a slightly nutty and sweet flavor. Annatto originates from Brazil where the coloring was used to sooth heartburn or even gastric distress, as well as a sunscreen and body paint. 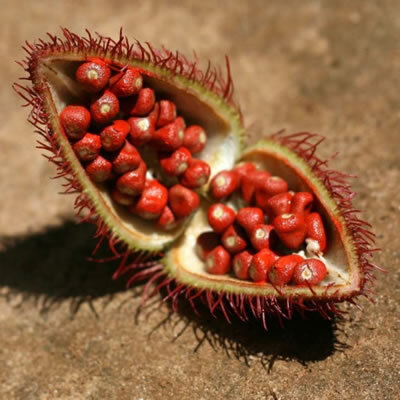 However, annatto has long been used for body painting and art in the Caribbean and South America. The main producers of annatto seeds are Brazil, Kenya, and Peru. Annatto functions as a food coloring and imparts a slight flavoring as well. The principle pigment in annatto is cis-bixin, a carotenoid. In baking, annatto is used as a food coloring to impart a yellow or orange tint to baked goods. For instance, annatto is used to enhance the color of fillings, frostings, gels, and create food colorings. Annatto is a rich source of antioxidants and Vitamin E. Some food allergens have been linked to the presence of annatto extract, however, it is not considered one of the eight major food allergens.